September: back to school, the nights are drawing in and it’s the start of autumn with the Autumnal Equinox on the 23rd – at 09:21 to be precise. And now for the good news: you can still see that most beautiful of planets, Saturn. Start looking as soon as the sun sets a little after eight (chocolate time?). Above the sunset, almost exactly west at this time of year, you should see a star, technically the brightest star in the sky at the moment. This is Arcturus at the bottom of the constellation of Bootees. To the left and only just above the horizon, shining at a similar brightness but looking dimmer, is Saturn. This month is our last chance to see it, as it starts to get too low next month. I feel sort of sorry for Saturn this year as it has been on show (for us early evening observers) during the summer months, just when the planets are at their lowest in the sky. Still, it’ll be back next year. The most exciting event this month is a total eclipse of the Moon. Sadly it occurs during the early hours of a school day, on the 28th. It begins at 01:11 that morning when the bright, silvery full Moon will begin to turn a dull red from the top left. The redness will spread across the Moon’s face, like a sort of red weed (cue Jeff Wayne? ), completely covering it by 03:15. It remains this colour till about 04:20 when the usual silvery brightness will spread back across, following the path taken by the redness, and we get our proper full Moon back by 06:22. If you have to get up during the night for any reason, take a few minutes to study this rare phenomenon. It will be worth it; we don’t get another one for three years. If you’re up about six in the morning for whatever reason, it’ll be worth having a quick peek towards the sunrise as Venus is on show at this time all month. Also this month, we have not one but two launches to the International Space Station. First off, due on the 2nd is Soyuz 44, on a so-called taxi mission. It will definitely carry two cosmonauts to the station and there was a strong rumour that Sarah Brightman was to travel as a tourist, but withdrew back in May. 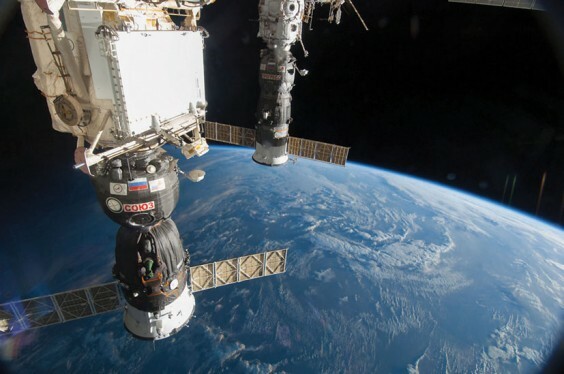 NASA only vaguely refer to a third crew member, so who are the Russians putting into orbit? Anyway, one of them, Andreas Mogensen, the first Dane in space, only stays for ten days before he ferries another cosmonaut back to Earth. I wonder if he picks up in Alvechurch? Then on the 21st another Russian vehicle launches to carry supplies into orbit. This is basically a Soyuz craft but modified to carry freight rather than passengers, so is known as a Progress and this one is number 61. Sadly I don’t know if you will be able to see either of these craft – only http://www.heavens-above.com has that secret – but the night sky is always worth viewing. Above: Soyuz and Progress docked to the ISS. Picture courtesy of NASA.